Popular Punjabi dish of Indian cuisine comprises of chickpeas, fairly dry & spicy with a sour citrus note. Famous Indian dish made of potatoes and peas cooked with Indian spices. Flavorful vegetarian dish made with potatoes, cauliflower & many spices which makes it fragrant & mouth watering. Fried potatoes cooked with chooped eggplant. Stew of lentils tempered with Indian spices & cooked in butter to melt your heart away. Stew of whole black lentil & red kidney beans cooked in Indian spices & butter to melt your heart away. Delicious combination of several vegetables cooked in rich creamy sauce. Deep fried spiced Indian cottage cheese dumplings in cream yellow sauce. Diced Indian cheese cooked in rich creamy sauce. Cut mushrooms & peas cooked in rich creamy gravy. Diced Indian paneer cooked with peas in thick onion gravy with herbs & spices. Diced Indian cheese cooked in curry with coriander toppings. An Indian dish consisting of spinach & Indian cheese cooked in thick creamy curry. Cottage cheese cooked in rich gravy with tomatoes, butter & cream. Cottage cheese cooked in thick gravy with herbs & spices. Diced cottage cheese cooked in chef's special curry. 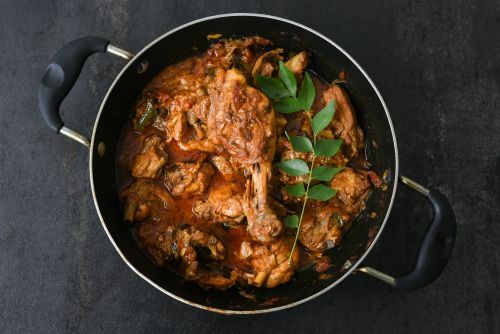 Chicken cooked in traditional North Indian style in raw spices tendered to melt in your mouth. Chunks of meat cooked in chef's special spicy curry. Fish cooked in Indian herbs & spices in typical North Indian style. Full of flavour & taste cooked with plenty of spices to keep you guessing the ingredients. Prawns cooked in Indian herbs & spices in typical North Indian style. Round shaped bread made with wholemeal flour. Bread cooked in clay oven & topped with butter. Naan jewelled with chopped garlic. Naan stuffed with shredded cheese. Naan stuffed with cheese & jewelled with garlic. Naan stuffed with cheese & chillies. Naan stuffed with chopped spinach & cheese. Naan stuffed with a Punjabi style spicy potato mixture.